Indonesia Uninterruptible Power Supply (UPS) systems market is gaining pace on account of growing demand in IT, commercial and industrial sectors. Further, the country's government is focusing on strengthening the economy by investing heavily in the commercial and industrial sector infrastructure, which in turn would ultimately spur the growth of commercial and industrial sectors, resulting in an increase in demand for UPS systems in the country. According to 6Wresearch, Indonesia UPS Market size is projected to grow at a CAGR of 4.6% during 2018-24. Expected growth in the country's infrastructure on account of significant emphasis on ICT, Banking and Financial, Healthcare, Aviation and Commercial sectors would drive the demand for UPS systems in these segments, where seamless power support is necessary for several crucial operations. Government initiatives such as 100 Smart cities by 2020 and 1,000 technopreneurs by 2020 are expected to further boost the UPS market during the forecast period. Java Region is projected to capture the highest Indonesia UPS market share over the coming years due to the development of the commercial and industrial sectors owing to outsize concentration of people, wealth, foreign investment and political capital as well as rapid urbanization. Java will continue to account for an outsize proportion of investment and construction activity in Indonesia over the next 10 years. On account of robust economic growth and industrial expansion, Java is predicted to continue its dominance in future as well. 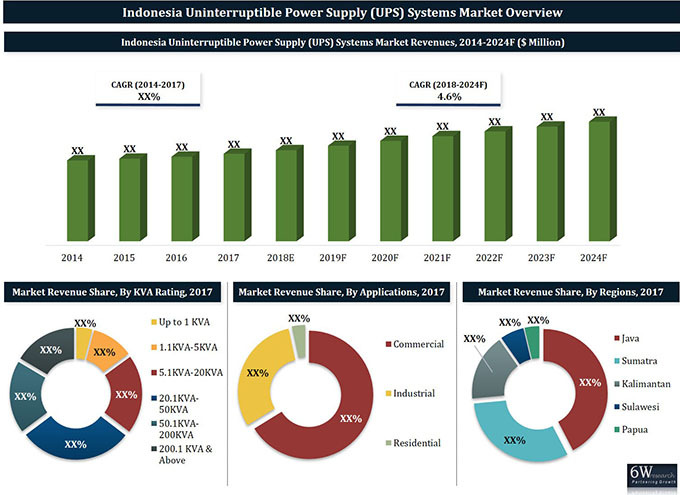 The Indonesia UPS market report thoroughly covers Indonesia Uninterruptible Power Supply (UPS) systems market by KVA ratings, applications and regions. The Indonesia UPS market outlook report provides an unbiased and detailed analysis of the Indonesia UPS market trends, opportunities/high growth areas and market drivers which would help the stakeholders to device and align their market strategies according to the current and future market dynamics.